This versatile piece keeps those you love close to your heart. Luminous white topaz and oxidized Sterling Silver come together to give the illusion of black diamonds in this beautifully crafted round locket necklace. Our Roxy photo locket necklace evokes the image of theater footlights with a circle of topaz in the center of the pendant. This keepsake locket reminds us of a grand age of Hollywood. The locket suggests Busby Berkeley movie images creating complex but beautiful patterns by glamorous women. The grand movie palaces of the 1920's and 30's were perfected by man who went by name Roxy. He eventually founded Radio City Music Hall and the Rockettes, who were originally called the Roxyettes. When we designed this piece it was with Old Hollywood charm in mind. Images of Ginger Rogers, Dorothy Lamour and Rita Hayworth came to our minds as well as some of the women we know that still represent that type of old school glamour today. Locket measures 18mm diameter. 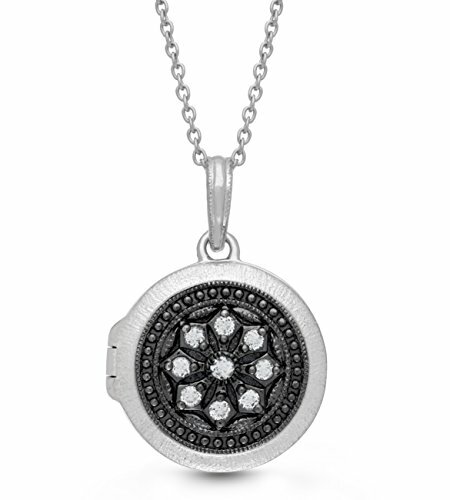 Includes Sterling Silver locket pendant with White Topaz and sterling silver chain. Available in chain lengths from 18" to 36". Our 18" through 34" necklace chains come standard with a 2" jump ring which may be used to shorten the chain by 2" and allows two length options.